Solar Metal Roofs - TMC Engineering Ltd.
An ecological resource with a low carbon footprint that harnesses the sun’s renewable energy. The PV system’s efficiency typically improves when it’s installed on a cool metal roof increasing the energy output of the solar modules. 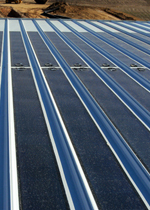 This lightweight option, approximately ¾ pound per square foot, is typically adhered to the metal roof panel in a Star manufacturing facility, allowing the solar array to be installed as the roofing system is installed. Thin film is less efficient than crystalline modules with a 5-10% efficiency rate at about 5 watts per square foot. Flexible thin film does perform better than crystalline modules in low light conditions. 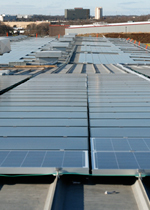 From 700W to 60kW, Star kits work well for existing or new commercial construction projects. Star will provide the education, guidance, technical support and most of the materials needed for a successful solar implementation. Leading brand name polycrystalline or amorphous silicon PV modules. DC Electrical wiring (DC fuses and 50’ wire whips for each string sized to meet the requirements of the National Electric Code (NEC) to connect the solar module strings to the combiner boxes). An electrical contractor, knowledgeable about solar PV installations, will be required to install the electrical components of the PV system. The contractor will also decide the best location for the inverter and provide wiring and conduit to run from the combiner boxes on the roof to the inverter and from the inverter to the meter box as well as all disconnects and any other equipment required by the local utility company. The electrical contractor will contact the local utility company to determine all requirements for the PV system to be connected to the grid. TMC & Star have the expertise to model PV systems in this fashion for most locations in the Bahamas & throughout the Caribbean as well as perform payback calculations for those systems taking advantage of the latest incentive programs.